At least 80% of all HIV positive pregnant women and HIV exposed infants have access to more efficacious ARV prophylaxis by 2015. At least 80% of all HIV exposed infants have access to ARV prophylaxis by 2015. 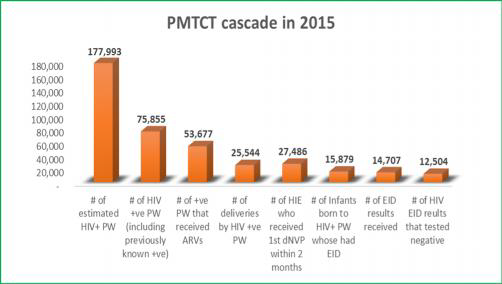 Data from the states showed that only one state (Ebonyi) achieved greater than 80% coverage for HCT in PMTCT. 3 states achieved greater than 70% while 4 other states achieved greater than 50% coverage. Even in states where HCT coverage was high it was not accompanied with similar high coverage for those who received ARV. 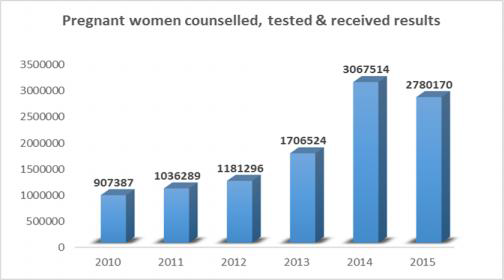 This can be attributed to weak referrals system, linkages and follow up of positive pregnant women. Inadequate coverage of EID services. Industrial strikes by health workers in most part of the year also contributed to low coverage recorded in 2015. Improved ownership and government funding of PMTCT programmes at all levels. Increase the involvement of the private sector in PMTCT program. Already NACA has concluded plans to pilot a performance based funding HCT for PMTCT program for 390 private health facilities in the 12 plus one states. Also in two states of Abia and Taraba respectively the FGN through NACA is providing funding to engage actively with traditional birth attendants (TBAs) to boost PMTCT program in the two states. Improvement in supply chain and logistics including strengthening the referral system and linkages for PMTCT.